Home > Freedom Scientific, Inc.
Found 17 file extension associations related to JAWS and 17 file formats developed specifically for use with JAWS. JAWS (Job Access With Speech) is a computer screen reader program in Microsoft Windows that allows blind and visually impaired users to read the screen either with a text-to-speech output or by a Refreshable Braille display. JAWS is produced by the Blind and Low Vision Group of Freedom Scientific, St. Petersburg, Florida, USA. 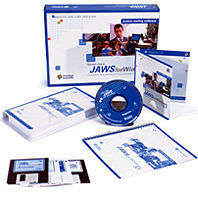 JAWS installs with an enhanced, multi-lingual software speech synthesizer, “Eloquence for JAWS.” Languages include: American English, British English, Castilian Spanish, Latin American Spanish, French, French Canadian, German, Italian, Brazilian Portuguese, and Finnish. Enhanced support has been added for today’s most popular applications, including Microsoft® Office, Corel WordPerfect® Office, and IBM Lotus® Notes®. If you need more information please contact the developers of JAWS (Freedom Scientific, Inc.), or check out their product website.